This post is brought to you by Puracyn OTC Wound Care Spray. All opinions are our own. The beginning of the season is full of favorite “summer firsts.” From your first BBQ on the back deck to the first time at the pool, it’s a time of year full of fun celebrations. Our favorite summer first is the first water blaster fight! My son spends a lot of time outdoors in the summer, which means far more potential for scrapes and wounds! My least favorite summer first: the first skinned knee or elbow. It happened at my son’s birthday party. He was riding his scooter and lost his balance. Thankfully it was a minor scrape that didn’t require medical attention. Puracyn makes wound care as easy as taking off the cap and pointing the nozzle at the wound. Just spray Puracyn OTC Wound Care Spray on the scrape, add a bandage and you’re done. You don’t even need water to clean the wound! Most important- in my son’s eyes anyway- it doesn’t sting! It contains no antibiotics or steroids, just compounds that mimic your body’s natural wound cleaning process. Seriously, there is nothing worse that a wound care product that hurts as much as the wound! Thankfully Puracyn takes the sting out of the less exciting summer firsts. With more than half of all outdoor recreation accidents taking place in the warmer months, making Puracyn part of your first aid kit is just smart thinking. It’s so portable that you can toss it in your tote along with a package of bandages. 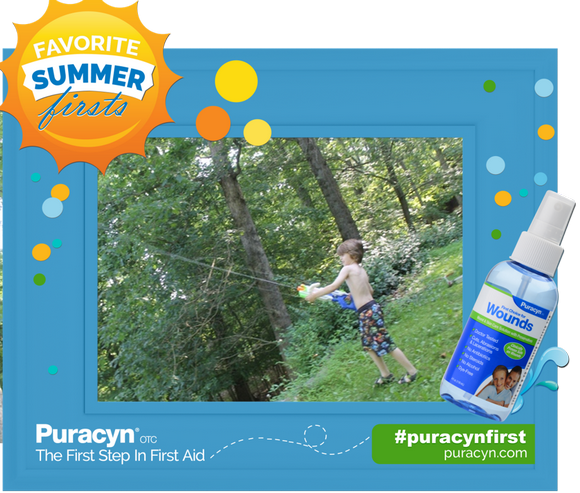 Puracyn OTC Wound & Skin Care is available in the first aid aisle at Meijer, Rite Aid, Walgreens and other retailers nationwide in 4 oz. bottles, for a suggested retail price of $14.99. Now through July 24th, you can enter for a chance to win a weekly prize of a summer themed package to help you have fun at the beach, on a camping trip and more. Each week a new winner is selected. Winners will also receive a Puracyn First Aid Kit. Learn more about the sweepstakes on the Puracyn Facebook page. You can also enter here. What’s in your first aid kit for tending to minor wounds on the go? You’re so so so right about nothing being worse than a painful wound care. All it takes too, is one time and the kids remember that every single time they have a boo boo. Glad to know that there is a good alternative to traditional owie treatments.